Compatibility with old user agents is very important to me, because I strongly believe that if you buy a computer at any time, and it works perfectly, then you should be able to stick to that computer for as long as you wish. After all, a writer who bought a high-quality computer in the late 90s should still be able to use it the exact same way he did when it was new. In addition, if you do separate content (HTML) from style (CSS) as you should do, it should not be particularly difficult to ensure a decent fallback on old user agents. Before the recent markup improvement on my sites, they were essentially compatible with every version of Internet Explorer from 5.0. 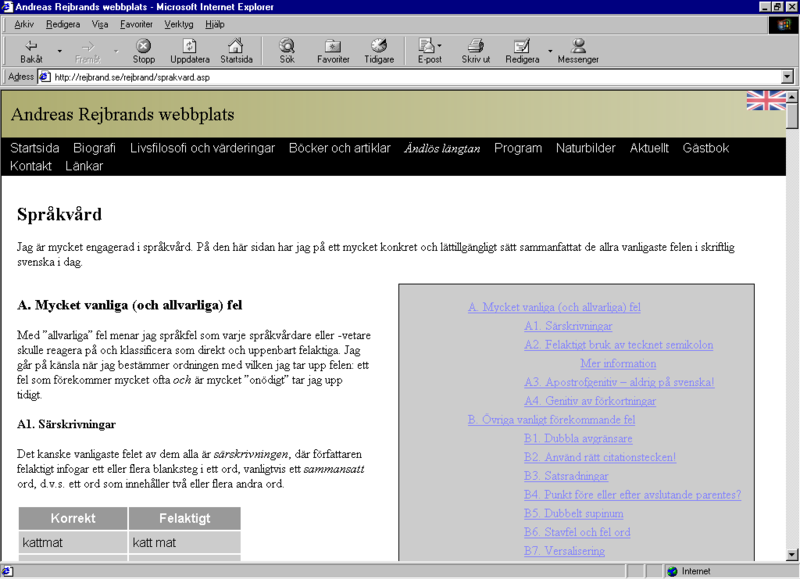 The new markup, which is far more elegant, efficient, and modern, requires only little more: Internet Explorer 5.5. Hence, my sites remain very compatible in this respect. 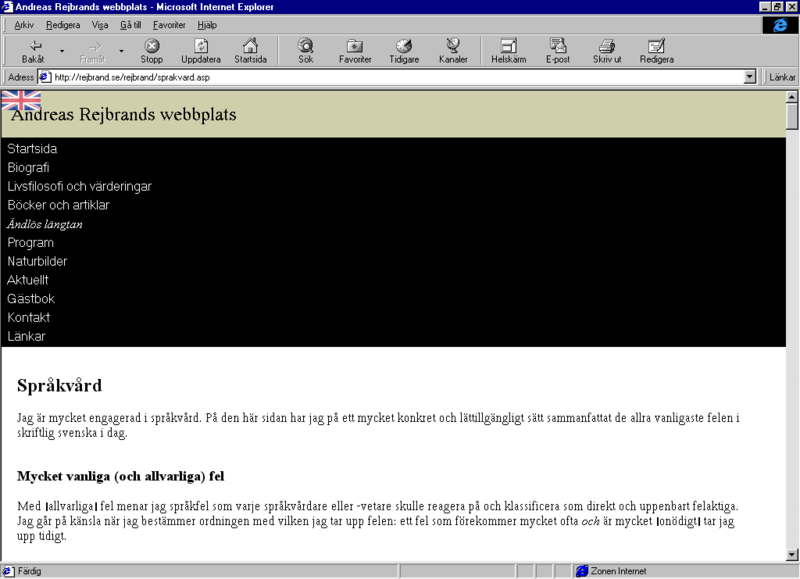 As a comparison, some of the most visited sites on the web fail already in Internet Explorer 6.0 on Windows XP (microsoft.com being one example). 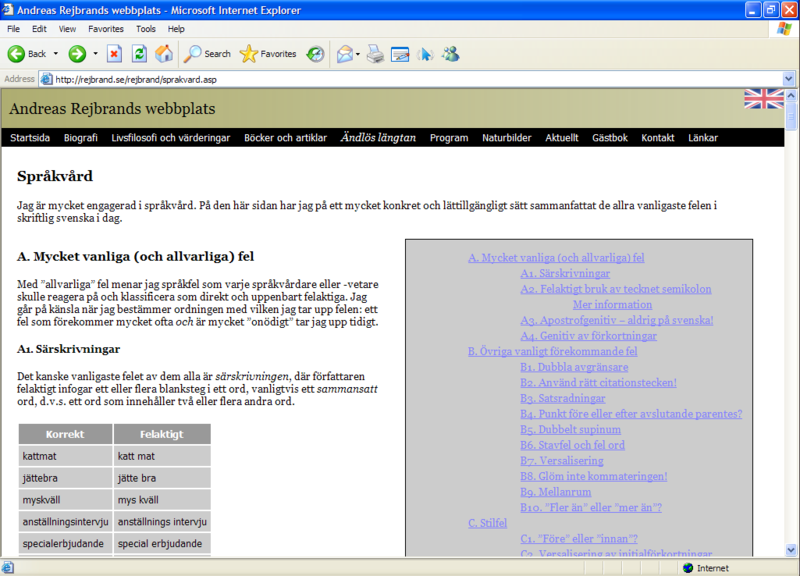 Internet Explorer 10 is the most recent (stable) version of Internet Explorer, and this produce the reference rendering of the page. 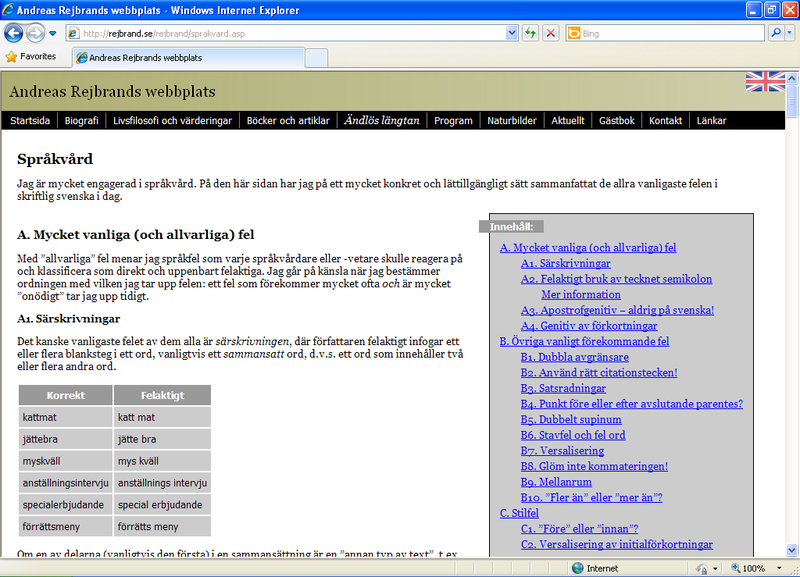 Of course, the page looks exactly the same in any modern browser (Chrome, Firefox, Safari, Opera). See screenshot. In Internet Explorer 9, we lose support for the text-shadow property, which is used as a special effect when hovering the logo at the upper-left part of the page. 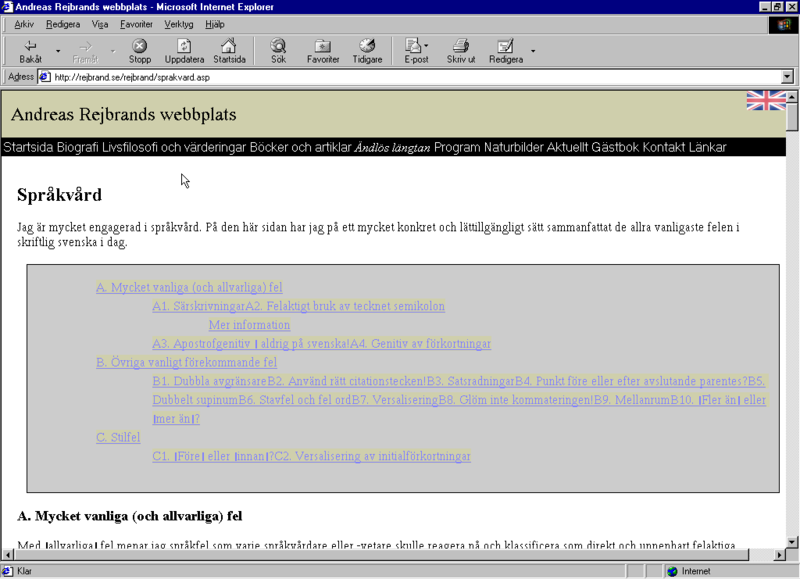 It cannot be stressed enough how unimportant that feature is; hence, essentially, my site looks perfect even in IE9. It is interesting to notice, however, that the square bullet (in a UL, say) has a very distinctive look in IE9. See screenshot. 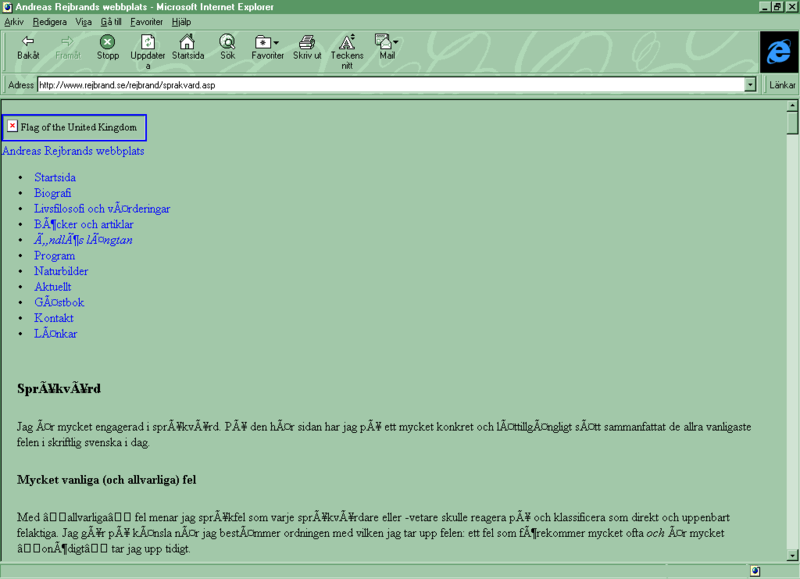 Turning to Internet Explorer 8, we lose box-shadow, as apparent in the screenshot from Windows XP. We also lose the :last-child and :not selectors used in the pixlinks (see below). 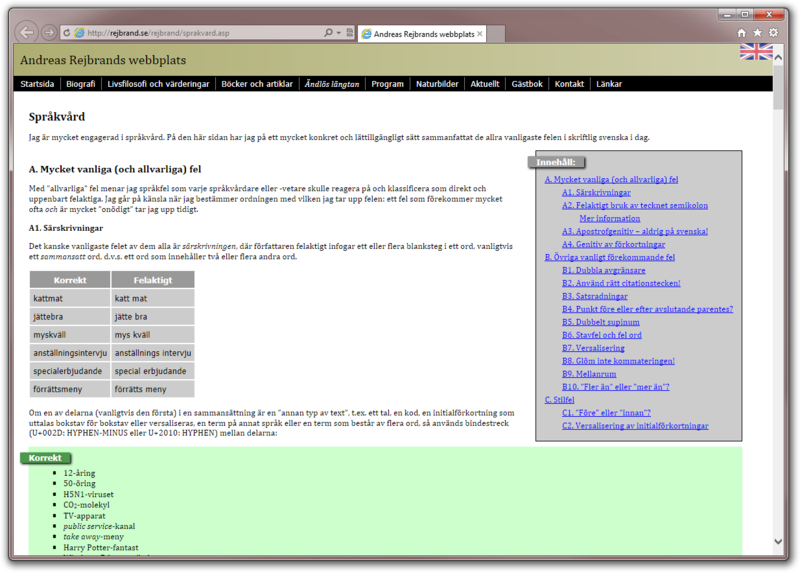 Moving on to Internet Explorer 7, we lose CSS generated content (:before, :after, and content) and, at the same time, :lang(). At my sites, a link on a page in Swedish to a page in English is marked with the flag of the United Kingdom, and similarly the other way around. These are added using CSS content, the language selector, and attribute selectors testing the hreflang attribute on the anchor element. 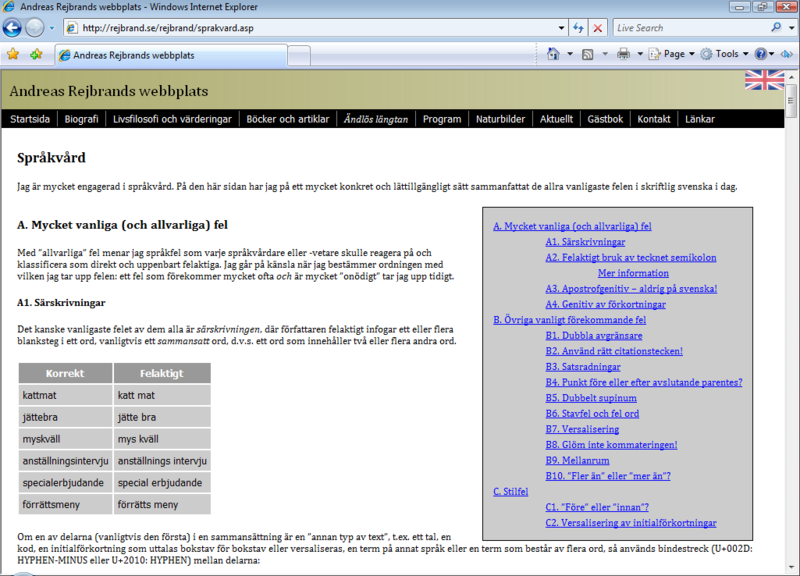 Also, an article in one language, found on a page in the other language, display a flag in the header. 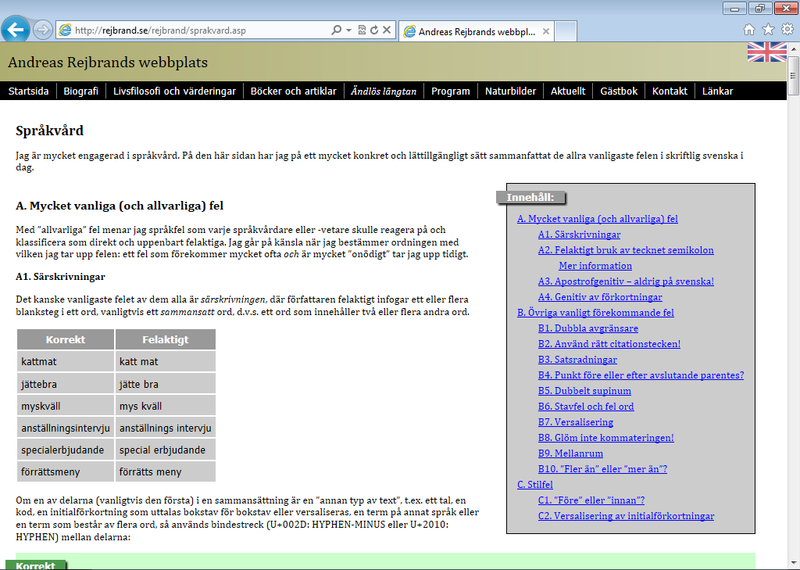 This is also done using CSS generated content and the language selector. Apparently, these features are lost in IE 7. Screenshot from Windows Vista. Perhaps the most thrilling observation of them all, however, is that the vector linear gradient in the logobar works all the way down to Internet Explorer 5.5.